Andrew Wyeth painted Helga Testorf in secret for 13 years before the world, and his wife, saw the paintings for the first time. The secrecy and intimacy of these paintings stirred quite the scandal when they were first exhibited and they continue to be a source of much conjecture into the details surrounding Wyeth’s relationship with one of his greatest muses. Find out more about the character of Helga both within, and outside of, Wyeth’s life and paintings during a talk given by Patricia Junker, SAM’s Ann M. Barwick Curator of American Art, in the Andrew Wyeth: In Retrospect galleries. Andrew Wyeth: In Retrospect is on view at Seattle Art Museum through January 15 and the next Wyeth Wednesday tour with Patricia Junker will take place January 3. Judges’ Pick: Based on a cumulative score of the following categories: creativity, connection to Wyeth, and concept. When we say that Andrew Wyeth: In Retrospect offers new perspectives on the life and career of this American master, one of the things we mean is that the exhibition explores the cinematic influence of Andrew Wyeth’s work. Wyeth drew inspiration from filmmakers such as King Vidor and Ingmar Bergman as well as visually influenced a wide range of moving image classics, from Twin Peaks to Texas Chainsaw Massacre. To imbue this new insight into Wyeth’s work with more dimension, SAM invited local filmmakers to create a short film over the course of a week inspired by paintings in Andrew Wyeth: In Retrospect during the Wyeth Film Sprint. There were very few rules, but the key was that the film had to incorporate one of the preselected Wyeth images. Over 200 people attended the public screening on November 8 of 25 submitted films, followed by an awards ceremony honoring $500 each to three winning films. The judges were Patricia Junker, SAM’s Ann M. Barwick Curator of American Art; and local filmmakers and artists Clyde Petersen and Wynter Rhys. As well as the audience, which selected a winner. Here are the three winning films for your entertainment. We love them all. The Judges’ Pick, above, will linger with you, the Curator’s Pick grapples with the gossip surrounding Wyeth’s greatest muse, and the Audience Pick revels in the surreal oddity and dark humor that Wyeth dabbled in. Curator’s Pick: Patti Junker selected a single film that she felt was most evocative of Wyeth’s practice and work. Audience Pick: Visitors selected one film that was tallied at the end of the night. Andrew Wyeth’s studio was an old schoolhouse near his childhood home in Chadds Ford, Pennsylvania. 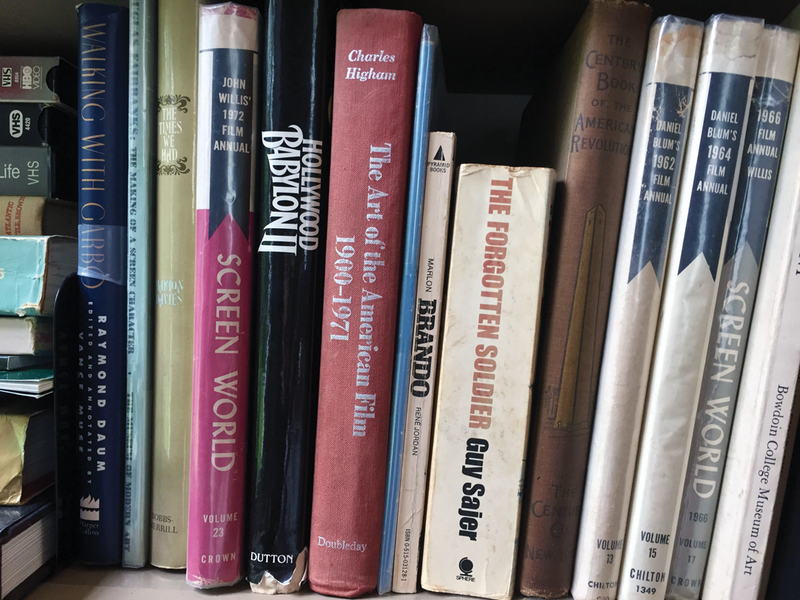 His bookshelves there hold numerous titles on film. 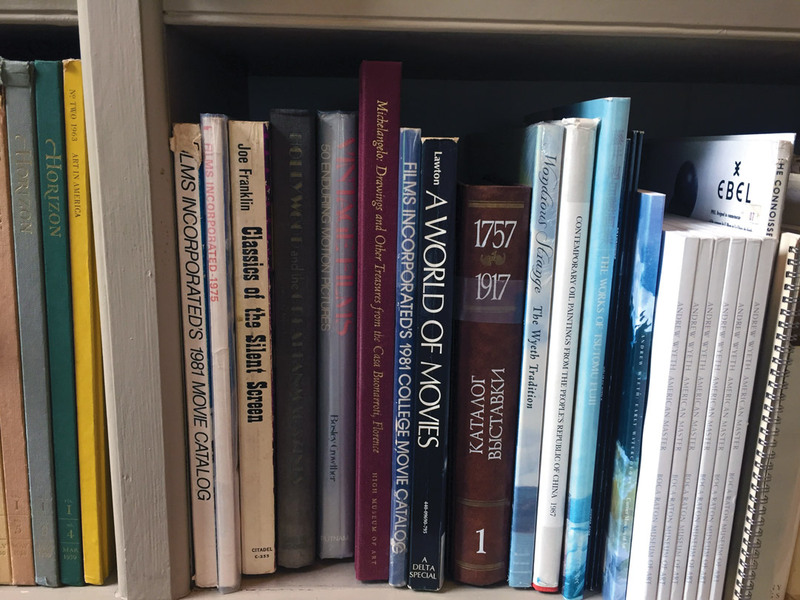 From movie rental catalogues to a Marlon Brando biography, to Classics of the Silent Screen, this view inside the American icon’s creative space sets Wyeth against a backdrop of the movies. Wyeth is sometimes considered a realist in an abstract art world; however, this limited focus on his realism glosses over his strange and eerie images. But on the 100th anniversary of the artist’s birth, Andrew Wyeth: In Retrospect examines what creates Wyeth’s haunting effect on us and shows the influence of cinema on his art through his 75-year career. This major exhibition presents more than 100 of the artist’s finest paintings and drawings, including rarely seen loans from the Wyeth family. Betsy Wyeth likened her husband to Swedish director Ingmar Bergman: “He’s creating a world they [his models] don’t realize and they’re acting out a part without any script.” In the 1989 painting Snow Hill, Wyeth’s Chadds Ford models, living and dead, dance on Kuerner’s Hill—a meaningful motif in Wyeth’s paintings—and recall Bergman’s dance of death from the iconic final scene of The Seventh Seal. Just as Death dances the players off to their graves in the film, Wyeth danced his characters off to their art-muse graves, and he would never use them again. An owner of King Vidor’s 1925 silent masterpiece, The Big Parade, Wyeth claimed he watched these film reels hundreds of times. A young man running down Kuerner’s Hill in Wyeth’s Winter 1946 echoes the film’s hero hobbling down a hillside into the arms of a lost love. The Big Parade used objects to convey emotional states and inspired Wyeth to depict belongings and interiors as portraits, as in a pair of weathered doors that represent the deceased brother and sister in Alvaro and Christina (1968). “Think of Wyeth’s paintings as movie stills—each as a frozen moment within some ongoing action,” says Junker. “What story do they tell?” Andrew Wyeth: In Retrospect offers a chance to piece together the story of Wyeth himself—his figures are characters acting out a role in the artist’s life, allowing us to understand him. The exhibition is an epic, the story of a great American artist told through the people and places he portrayed. Widen your view into Wyeth’s World through SAM’s screenings of these, and other, films that either influenced Andrew Wyeth or vice versa. The Big Parade will be screened on November 15 and The Seventh Seal is presented as part of an Ingmar Bergman series on January 25. Find out more about all of SAM’s upcoming film events and get inspired. 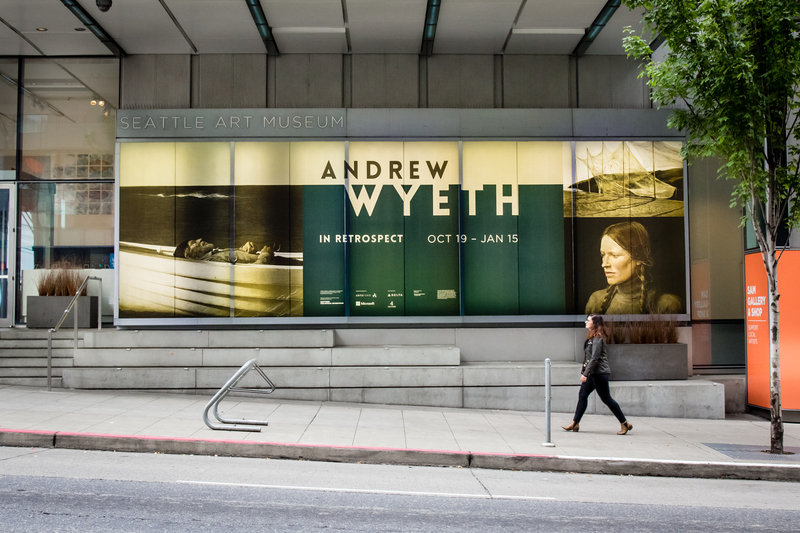 “See Wyeth whole and re-evaluate his stature as an artist,” says Michael Upchurch in his exhibition preview featuring an interview with curator Patricia Junker that appeared in Sunday’s print edition of the Seattle Times. Andrew Wyeth: In Retrospect opens this Thursday. Welcome the return of layers with SAM’s video featuring Haida artist/fashion designer Dorothy Grant talking about her exquisite Raven Great Coat, now on view on the third floor. City Arts’ Margo Vansynghel on Pantry by Joey Veltkamp and Ben Gannon, which ran for one night only as the final show of Calypte Gallery. Seattle Times’ Gayle Clemans invites you to get “[UN]contained” at CoCA’s new artist residency site held in three shipping containers; the first three artists were Anastacia Renee Tolbert, Anissa Amalia, and Edward Raub. Darren Davis of Seattle Met interviews the inimitable Waxie Moon on the eve of his (non-singing) opera debut in The Barber of Seville at Seattle Opera. Behold, 24 newly minted geniuses. OK, they prefer to say “MacArthur Fellows.” Amongst the ranks are painter Njideka Akunyili Crosby, photographer Dawoud Bey, and two authors soon visiting Seattle. Yes, wire hangings! The innovative wire sculptures of mid-century artist Ruth Asawa are now on view at David Zwirner. Artnet asks: why did this re-appraisal of her work take so long? Kehinde Wiley and Amy Sherald will paint the official portraits of Barack and Michelle Obama for the National Portrait Gallery. They are the first black artists commissioned to paint a presidential couple. I think we can all agree that GIFs are an important and moving art form. Now, there’s an instant camera that creates GIFs you can hold in your hand. 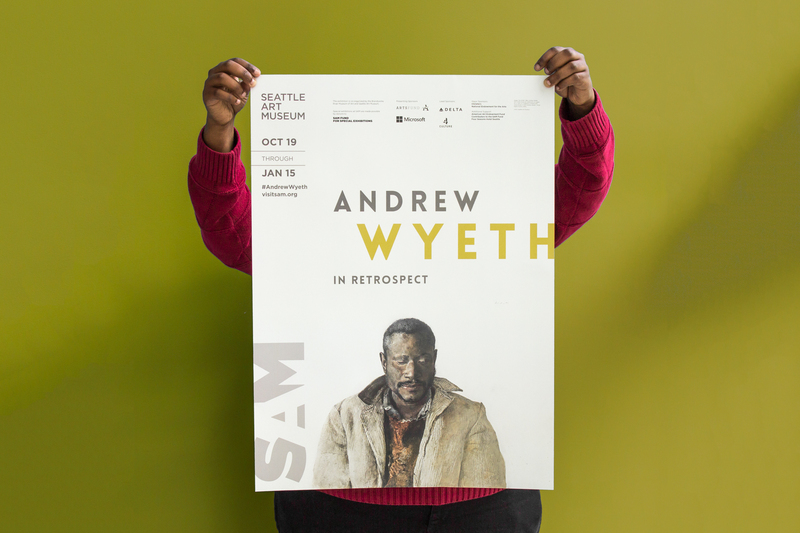 Andrew Wyeth: In Retrospect was featured in the Seattle Times’ fall arts preview among the visual arts recommendations. And Seattle Met’s October print edition recommends In Retrospect as one of their picks for the month, noting the “profound emotional stakes underneath all the quotidian realism” found in Wyeth’s work. The Seattle Times film critic Moira Macdonald previews the upcoming 40th edition of our film noir series, the longest-running in the world. SAM’s own Greg Olson is interviewed. Seattle Weekly’s Minh Nguyen reviews the “luminous, underrated” media art of Doris Totten Chase, now on view at the Henry. Now at the Frye: Three photomedia collections from three different artists. Seattle Met has the details on these “unmissable” exhibitions. Ferry over soon to the Women in Photography exhibition at the Bainbridge Island Museum of Art, says Crosscut. It closes there October 1.
artnet News on the amicus brief signed by over 100 arts institutions that supports overturning Trump’s immigration ban; SAM signed on when it was filed several months ago. Figuring History: Robert Colescott, Kerry James Marshall, Mickalene Thomas artist Kerry James Marshall is everywhere! Here’s ARTnews on his upcoming mural for the Chicago Cultural Center with portraits of 20 women who’ve influenced the city, including Oprah and Gwendolyn Brooks. Recent things that have been inspired by Andrew Wyeth: An accessory line’s lookbook, an indie film that premiered at TIFF, and Darren Aronofsky’s latest, mother!. Something’s in the water. My Best Friend™ Tracee Ellis Ross answers Vogue’s 73—yes, 73—questions and is DELIGHTFUL. We are very excited to congratulate Patti Junker, the Ann M. Barwick Curator of American Art at SAM, on receiving the prestigious Frost Essay Award from the Smithsonian American Art Museum. Click here to read her essay. The Smithsonian American Art Museum has awarded the 2010 Patricia and Phillip Frost Essay Award to Patricia Junker, the Ann M. Barwick Curator of American Art at the Seattle Art Museum. Her article, “Childe Hassam, Marsden Hartley, and the Spirit of 1916,” appeared in the fall 2010 issue (vol. 24, no. 3). The article presents a close contextual study and comparative analysis of Hassam’s production of impressionist paintings of American flags with an exhibition of Hartley’s abstractions of German military motifs at Alfred Stieglitz’s gallery 291 in the spring of 1916 when American sentiment about World War I had reached a fever pitch.